tom29739 renamed T172065: Hunt for Toolforge tools that load resources from third party sites from Hunt for Toolforge tools that loads resources from third party sites to Hunt for Toolforge tools that load resources from third party sites. Thibaut120094 awarded T131561: Tool Labs users .bashrc file does not exist for tools accounts a Like token. tom29739 added a comment to T138464: glam2commons (previously Single Image Batch Upload): Write and deploy initial and usable version. @tom29739: That would be wonderful, would it be a good idea to have a small chat on IRC this evening or tomorrow to discuss how we see the project and some next steps? I can help with this project. I have experience in Python for software development, and I maintain a few tools on Tool Labs. I've also used Wikimedia's OAuth in one of my tools. tom29739 added a comment to T157838: Move wm-bot instance to Trusty. The easiest and safest solution would probably be using something like Bucardo (live migration tutorial). tom29739 added a comment to T158704: Wikibugs always points to the creation of the task. tom29739 added a comment to T157744: tools.spiarticleanalyzer: requesting installation of icu on bastion and kubernetes . PyICU requires the underlying C++ library to work, and this is in the libicu52 apt package on Debian Jessie. When this is installed, PyICU can then be installed in a virtualenv. Alternatively, the python-pyicu apt package can be installed, which installs PyICU and the underlying C++ library systemwide. One of the above packages would need to be installed in the python 2 Docker image to be used in Kubernetes containers. tom29739 added a comment to T155063: Create Updated NodeJS container for Tool Labs. The current version that is on Tool Labs, v0.10.25, was made end of life over 3 months ago. This means that it's a security risk. tom29739 added a comment to T154551: Investigation: Plan for rewriting XTools. The rebirth code is written using the Symfony framework: http://symfony.com/. I opted to use the framework because it is very similar to Ruby on Rails, with regard to the Model-View-Controller scheme. Also, it includes caching and profiling out of the box. GitHub <noreply@github.com> committed R1934:47ddd66dcf92: Add packagecloud badge. (authored by tom29739). tom29739 added a comment to T137146: Disable xdebug on Tool Labs. @scfc: I ran the tests and reported back in T137146#2388908. I found that while xdebug slowed down the requests by a small amount, it was NFS that slowed down the requests the most. tom29739 added a comment to T143939: Request creation of labs-vpn labs project. Is the configuration really that complex? https://wikitech.wikimedia.org/wiki/Help:Access_to_instances_with_PuTTY_and_WinSCP#How_to_set_up_PuTTY_for_proxying_through_bastion.wmflabs.org_to_your_instance looks tedious to repeat for every instance, but fairly simple. tom29739 added a comment to T143449: Install libenchant1c2a in the toollabs-python2-base docker image. The interim solution of using a compiled wheel of pyenchant no longer works because the wheel at http://tools-docker-builder-01.eqiad.wmflabs/pyenchant-1.6.7-py2.py3.cp27.cp32.cp33.cp34.cp35.pp27.pp33-none-any.whl has been taken down. Having the enchant C library (libenchant1c2a) installed in the image would remove the need for the wheel to be compiled and hosted. tom29739 added a comment to T136265: Develop evaluation criteria for comparing Platform as a Service (PaaS) solutions. Being able to use custom Docker images would be extremely helpful, because it removes the need to have to compile source or find binaries and/or ask for packages to be installed. tom29739 added a member for Tool-Zppixbot: tom29739. tom29739 awarded T147051: Provide at least 2 separate service endpoints: one for slow, long running queries; and another for quick, web requests a Mountain of Wealth token. tom29739 added a comment to T145907: Use .wiki domains instead of .org on wiki sites owned by wikimedia foundation. Why not just redirect the .wiki domains to the .org domains? tom29739 renamed T145130: Gerrit in Microsoft Edge doesn't display the git commands in the download box from Microsoft Edge in gerrit dosent display the git commands in the download box to Gerrit in Microsoft Edge doesn't display the git commands in the download box. tom29739 edited Description on privpol-captcha. 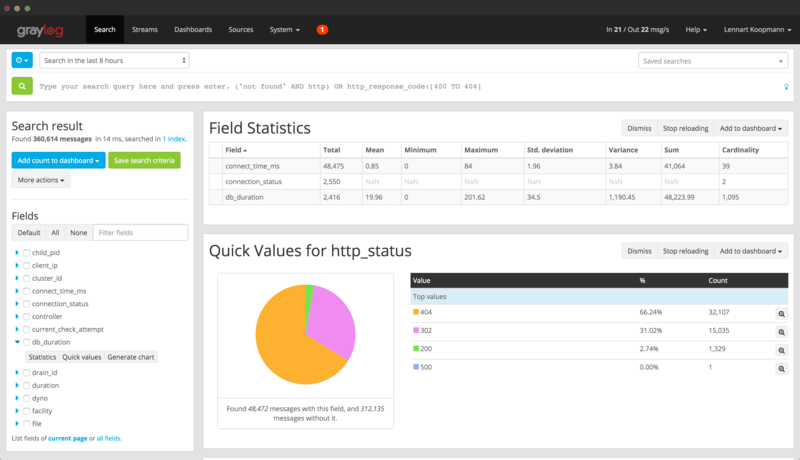 tom29739 added a comment to T127367: Provide modern, non-NFS error log solution for Toolforge webservices and bots. Be able to search through logs easier - searching is easy: http://docs.graylog.org/en/2.0/pages/queries.html, "The search syntax is very close to the Lucene syntax. By default all message fields are included in the search if you don’t specify a message field to search in." Provide a Filesystem based interface for log ingress - Graylog supports this: http://docs.graylog.org/en/2.0/pages/sending_data.html#reading-from-files, "we provide the Collector Sidecar which acts as a supervisor process for other programs, such as nxlog and Filebeats, which have specifically been built to collect log messages from local files and ship them to remote systems like Graylog." 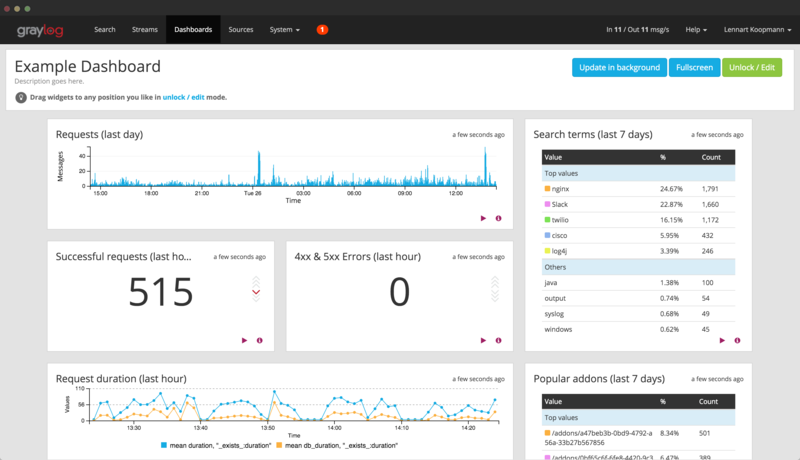 Graylog has Streams (basically categories for log messages): http://docs.graylog.org/en/2.0/pages/streams.html, alerting based on those streams: http://docs.graylog.org/en/2.0/pages/getting_started/stream_alerts.html, and dashboards: http://docs.graylog.org/en/2.0/pages/dashboards.html. Doesn't the ssh of Cygwin / MinGW / MSYS (not an expert here) work? Note that it is possible to configure openvpn so it only provides routes to a subrange (ie. labs hosts). It could be blocked anyway¹ but that would require the user misconfigurating his routes. ¹ Not sure if it is worth it, since labs users already can access the internet through their instances. You'd need labsdb/wmnet for database replica access. I'm not quite sure how DNS would work actually - the client would need to be able to resolve these, but then all their own DNS lookups would be going through labs? Would only carry traffic to Labs hosts (e.g. *.wmflabs/*.labsdb hosts), and not to internet. OpenVPN has clients for many different platforms, including Windows. OpenVPN is fast and secure. tom29739 updated the task description for T143939: Request creation of labs-vpn labs project. tom29739 created T143939: Request creation of labs-vpn labs project. tom29739 awarded T136256: Deploy "Striker" Tool Labs console to WMF production a Baby Tequila token. tom29739 created T143449: Install libenchant1c2a in the toollabs-python2-base docker image. tom29739 renamed T142877: Request increased quota for contintcloud labs project from Request increased quota for <Replace Me> labs project to Request increased quota for contintcloud labs project. tom29739 added a comment to T142166: Create a new labs flavor available to all project: largedisk. tom29739 renamed T142253: Update npm to 2.x on tools from Update npm to 2.x on lolrrit-wm to Update npm to 2.x on tools. tom29739 added a comment to T140592: About 71 users are missing replica.my.cnf. I have a replica.my.cnf in my home dir that was created in January 2016. There has been far more than 6 new users on Tool Labs so far this year. tom29739 updated the task description for T131796: Convert most top level tool and bastion dns records to CNAMEs. tom29739 renamed T131796: Convert most top level tool and bastion dns records to CNAMEs from Convert most top level tool and bastion dns redcords to CNAMEs to Convert most top level tool and bastion dns records to CNAMEs. tom29739 updated the task description for T76375: [DO NOT USE] New Labs project requests (tracking) [superseded by #cloud-vps-project-requests]. Ok in that case, going back to the second question - while a username might not be categorized as private information like IP addresses and passwords per se, should we still treat them with sensitivity in some cases since users might want to keep their association with particular tools confidential? That is even if we don't categorize usernames as information that must be purged or anonymized after 30 days, is this information still sensitive enough to warrant warning the user about the possibility of disclosure as covered in the current "If my tools collect Private Information..." disclaimer notice? I don't think that's the case. The user using OAuth via a tool will have their username disclosed to the tool though (subject to the usual private info restrictions at present). A tool that edit on a user's behalf via OAuth automatically disclose the username to MediaWiki revision table, thus publicly and permanently storing "This username has used this tool", and there's no way for the tool at all to change that fact. The tool used by a particular user, via OAuth, are publicly available information? If so, is this desired behavior (e.g. are there circumstance where a user might not want that fact they are using a tool to be disclosed)? tom29739 updated the image for Striker from F4294828: profile to F4305628: profile. tom29739 added a subtask for T139107: Issues with 'webservice' kubernetes backend (tracking): T141098: Kubernetes does not mount shared path. tom29739 added a parent task for T141098: Kubernetes does not mount shared path: T139107: Issues with 'webservice' kubernetes backend (tracking). tom29739 added a project to T139107: Issues with 'webservice' kubernetes backend (tracking): Tracking-Neverending. tom29739 added a parent task for T141082: Install jq, sed, grep, sort in k8s images: T141041: Odd kubernetes error. tom29739 added a subtask for T141041: Odd kubernetes error: T141082: Install jq, sed, grep, sort in k8s images. tom29739 updated the task description for T140110: Packages to be installed in Toolforge Kubernetes Images (Tracking). tom29739 removed a project from T141082: Install jq, sed, grep, sort in k8s images: Tracking-Neverending. tom29739 added a comment to T141041: Odd kubernetes error. @Magnus: T140110: Packages to be installed in Toolforge Kubernetes Images (Tracking) is the tracking task for packages to be installed in Kubernetes containers. You'll need to create a subtask of that. tom29739 added a comment to T121279: Figure out a way to keep MerlBot running when the HTTP POST loophole is closed. tom29739 added a comment to T115231: dplbot webservice on Tools Labs fails repeatedly. IMHO, username shouldn't be private information. Rather, the association of a username and other private information (IP address, User agent) should be private. tom29739 added a comment to T140103: Needing help running the webservice for a simple flask application. Cosine02 awarded T139264: wm-bot is not responding to any messages a Like token. tom29739 added a comment to T100526: Investigate why Joe is default editor on toollabs. There are 12 choices for the alternative editor (providing /usr/bin/editor). tom29739 added a comment to T139264: wm-bot is not responding to any messages. It doesn't appear to be working. It's not on IRC, so I'd assume it's not working. @yuvipanda did you delete the pid files when you tried to get it working? It crashed last time, so those files need to be removed. Should do that according to the docs. tom29739 created T139264: wm-bot is not responding to any messages. tom29739 updated the task description for T139162: Query runs over 5 hours without being killed. tom29739 added a comment to T136712: Virtualenvs slow on tool labs NFS. Perhaps ulimits are causing it? Indeed, or even a few months ago. The only significant thing I can think of as having changed since then is the NFS rate limiting, so I'd still like to maybe completely remove that and try testing this again to see if that's the cause. NFS was much faster about 5-6 months ago, when I joined. It's having an impact on the speed of other things too (e.g. the speed of webservices, especially with PHP). 19s is still a long time when it's supposed to run for less than a second. tom29739 reopened T138787: tools-exec-1216 down as "Open". @valhallasw looks like it's down again. tom29739 added a comment to T137924: Copy labmon data to new SSDs. It looks like it's spewing out incorrect gzipped data, which the browser can't decode so it downloads it as a file instead. Maybe the default DocumentRoot is in the wrong place so that the webserver is selecting the wrong file for the user's browser to interpret? That's the only plausible explanation that I can think of where setting the DocumentRoot would fix it. @yuvipanda Chrome Version 51.0.2704.103 m (32 bit) on Windows 7. download.gz is 707 bytes from the https:// version. WinRAR can open it, there's a file named 'download' inside which is 677 bytes. @yuvipanda neither 1. or 2. work for me, chrome tries to download a file called 'download.gz'. Both work with curl. tom29739 added a comment to T138438: Initial puppet run failing for new instances in privpol-captcha. @chasemp it just happens randomly, not every time but still often enough to get annoying. I don't think it's anything that I'm doing because Niharika was having the exact same issue on their project. tom29739 added a comment to T91162: RFC: Shadow namespaces. A potential problem I foresee is different languages wanting to use the same page name. If wikis A, B and C all want to use page name X, then which wiki's content is used? tom29739 added a project to T138438: Initial puppet run failing for new instances in privpol-captcha: Cloud-Services. tom29739 created T138438: Initial puppet run failing for new instances in privpol-captcha. tom29739 created T138417: Nova_Resource:Puppet.privpol-captcha.eqiad.wmflabs will not go away. tom29739 added a comment to T138373: wikitech: Tell people to log out and in again?. I got really confused by this yesterday, nothing worked, because I didn't know about this. tom29739 renamed T138138: Install debootstrap and fakechroot on tools from Install debootstrap, fakechroot and fakeroot on tools to Install debootstrap and fakechroot on tools. tom29739 added a comment to T138138: Install debootstrap and fakechroot on tools. My tools often need different packages to be installed, and sometimes these can be installed easily (binaries available to download) but often the only options for binaries is a custom apt repo, or compiling from source, which is very time consuming and doesn't always work. These packages would make it possible to make a chroot as a non root user, so packages can be installed inside the chroot with apt and can be used. tom29739 created T138348: Create new labs project privpol-captcha. tom29739 closed T138097: Create new labs project tools-xdebug-testing as Resolved. tom29739 closed T138097: Create new labs project tools-xdebug-testing, a subtask of T76375: [DO NOT USE] New Labs project requests (tracking) [superseded by #cloud-vps-project-requests], as Resolved. tom29739 closed T138097: Create new labs project tools-xdebug-testing, a subtask of T137146: Disable xdebug on Tool Labs, as Resolved. That project is no longer needed. tom29739 created T138138: Install debootstrap and fakechroot on tools. tom29739 added a subtask for T137146: Disable xdebug on Tool Labs: T138097: Create new labs project tools-xdebug-testing. tom29739 added a parent task for T138097: Create new labs project tools-xdebug-testing: T137146: Disable xdebug on Tool Labs. tom29739 created T138097: Create new labs project tools-xdebug-testing. tom29739 claimed T137146: Disable xdebug on Tool Labs. I discovered that NFS was a huge slowdown of all webservices, and that running a webservice in /tmp, I copied the files to the bastion /tmp and made a symlink, and it worked (strangely, lighttpd could access the bastion's /tmp, because there wasn't anything in the webserver host's /tmp when I checked). Although NFS did slow down the webservice hugely, other factors (like xdebug) are still affecting the webservice. I'm going to assign myself this task and do some more testing to find out whether xdebug (and maybe other factors) make a difference in the speed of the webservice. tom29739 updated the task description for T137956: wmbot command for@seen should ignore trailing spaces after user name. tom29739 created T137146: Disable xdebug on Tool Labs. tom29739 updated the task description for T136335: Allow self-serve database credential and permissions management for Tool Labs projects.